Okay, I’ll be honest with you: I have no idea why I did this. 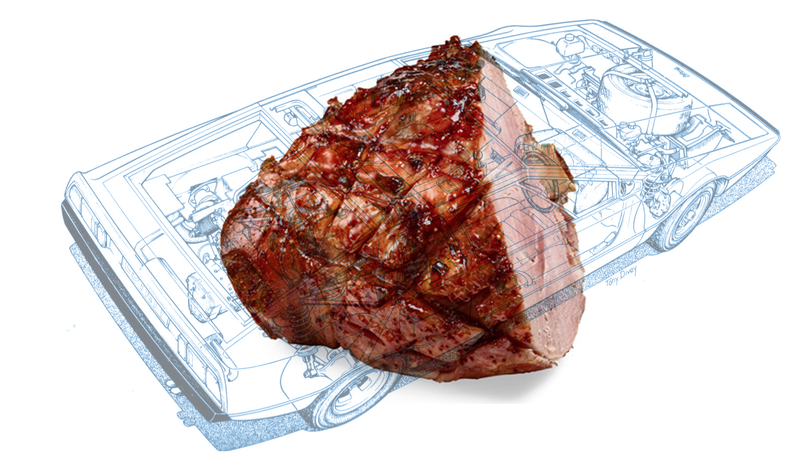 The phrase “car with a ham inside the engine compartment” popped into my head just now and sat there, tormenting me, until I exorcised it by making these quick photoshops. I don’t know the meaning. I don’t know the significance, if any. But I’m now passing this thought-virus on to all of you, and now you can do with it what you will. Hamshafts. Twin-ham engines. Forced pork induction. Variable ham timing. Four hams per cylinder. Hamrods. If you feel I’ve wasted your time, I apologize, but you have to admit, the headline promised what was delivered, right? You had fair warning. VHAM just kicked in, yo! This Stops In Front Of Your House -- What Does The Driver Yell? Happy Valentine&apos;s Day: What&apos;s Car-Related About This Flower?